I long ago dismissed with the idea that I would have a ‘favorite brand.’ These days, so much changes so quickly in fashion and luxury, it would be hard to pledge allegiance to one without being myself swayed this way and that way as the trends change. What was Gucci before is now a very different aesthetic, albeit with the same factories, know-how, and quality of production; those are long-term investments independent of design decisions. And anyway, being a blind devotee would make me an foolish, uncritical shopper. Some brands vary widely over time, given the myriad licensing deals they ink, farming out of eyewear, cosmetics, fragrance, and even clothing production (especially with diffusion lines) to third parties, who also manufacture for a checklist of competing brand names. It’s why I vowed never to pay more for a pair of Prada sunglasses, made with the same plastic as the Ray-Bans or Oakleys, and hardly even designed by Prada’s in-house team. [Many brands simply give guidelines to Safilo and Luxottica, which employ their own designers to interpret brands’ prevailing clothing designs for use in eyewear]. With any walk through an encyclopedic retail temple, like Barney’s, La Rinascente, or MR PORTER (click not walk), you’ll encounter so many brands. But not all are created equal. When you’re young, and marketing has a stronger effect on you, to purchase a Gucci card holder is to belong. This is the entire argument behind accessories with visible logos, i.e. signaling. As you age, though, marketing is less effective and your trained eye and mind can cut through hype to see what is real, what is a valuable, and what enhances your wardrobe to better reflect you, rather than telling its own story, where you are the advertising. This is, in part, why I have enjoyed so much my experiences at Bottega Veneta. While there is never a complete lack of brand identity, whether through distinctive colors, designs—or brand logos, it becomes a personal preference how much one would like his or her vestiti to be recognizable by brand. And if recognized, what exactly the brand says about the wearer. “Will these Valentino ‘open’ sneakers be too identifiable [or trendy], and if so, am I comfortable with what they will be saying about me?” They have been very popular around Milan in the last year or so. While I concede and wholeheartedly admit that there are many brands in the world (still mostly concentrated in Italy) which produce beautiful, masterful works of wearable art for your feet, hand, or back, many of which I would be happy to possess, there are very few which allow both the wearer and the product’s objective qualities to shine through. Those which put their brand name one step back. Of course, there is such a thing as too anonymous (too plain? ), whereby the item isn’t so strikingly beautiful enough, on its own, to warrant a given price, if some signaling cannot be gleaned from it. Often, consciously or not, we pay because we want the loud logo, or we want to join a trend. My personal balance is one toward subtlety, but not without allusion. One where maybe 10% of passersby could accurately dissect my outfit and assign brands to my pieces, based on cuts, patterns, etc. Avoiding the “victim” or “trendy” label is a win, but I never want to look unstylish. People tell me I’m stylish, but I still struggle to consistently strike the proper balance between colors, textures, and looks to execute my unique vision. My ‘expertise’ [passion] is mostly in footwear and accessories, so I am still exploring the basics of fit and finish of suiting, trousers, and the like. But this is not the subject of today. It is, simply, to delve a bit deeper into the past and present of Bottega Veneta. There is a history, though less lengthy than say Hermès, and a creative director. Under the thumb of Tomas Maier, the same person for the past fifteen years, a century in fashion, there are motifs and recurring themes. But in my opinion, he takes a balanced approach not seen elsewhere in the fashion industry. In Milan, I was surprised to find the staff at Bottega’s flagship maison on Via Sant’Andrea to be welcoming and hospitable. Though I have purchased plenty of times, I always feel awkward when I walk into a handsomely lit, marble-floored temple of beauty at Tom Ford or Dolce & Gabbana. BV is no different, but in any case, no one makes me feel like I don’t belong. Around January, during post-holiday sales, I dove deep headfirst into the brand and found myself toting home a bursting shopping bag with three pairs of shoes. Sadly, two of them fall into a category I described in my previous post—lovely but not applicable to my daily style. They are now for sale on Vestiaire Collective. Then, even without the money to spend, I bought myself a new wallet as a birthday gift in February. This time, in a bright “vesuvio” red-orange. This was the same night I attended a cocktail party to celebrate 50 years of The Knot, an evening minaudière interpreted season after season in curious and interesting new ways. 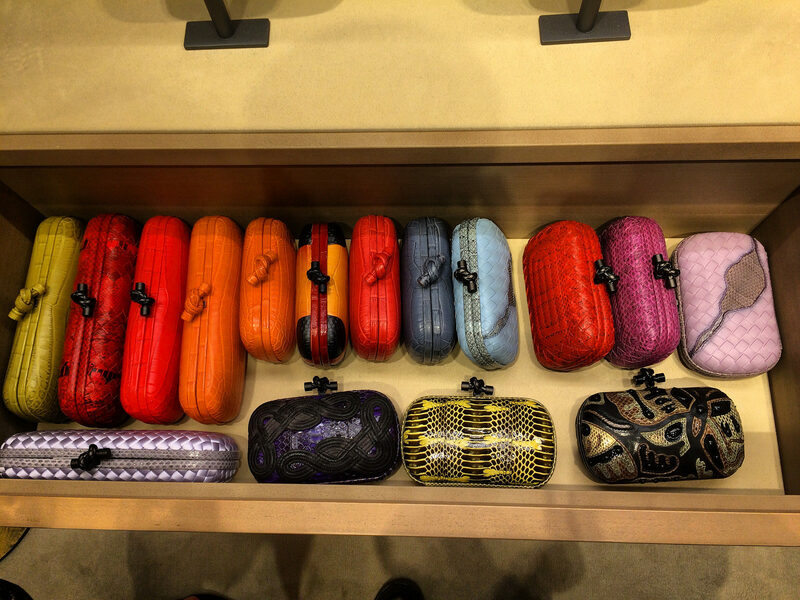 In April, I took the SDA Bocconi Luxury & Arts Club to tour the Bottega Veneta Home boutique. Throughout the months, I checked in regularly, just to say hi and use the bagno. It was worrisome not to see big crowds in the store even on days with good weather, like I did at Louis Vuitton and Gucci. One part of me would attribute the graciousness the BV staff showed to me as coming purely from boredom. In May, I stopped by to say hello and left with a new ring: sterling silver etched to look like intrecciato, studded with an irregular pattern of quartz fumé stones. Unfortunately, one of the stones fell out about two weeks later. It has since been repaired free of charge. Their jewelry carries a two year guarantee, I discovered. Even at Bivio, my favorite resale haunt, a cozy, double-thickness gray Bottega Veneta v-neck t-shirt made its way to me. Most recently, it was the siren call of the private preview sale which drew me in. I found a pair of dove gray penny loafers, leather thong sandals, a bracelet for a friend’s birthday, and then, what I consider to be a significant step: ready-to-wear. At full price, much of Bottega Veneta’s menswear is simply too dear for me, for right now. Their knits are just delicious, but at around €800, not even doable at 50% off. What was doable? A simple denim jacket in a staple-worthy medium-wash with minimal distressing. Classic, high quality. An excellent investment opportunity, right? And so here I write. In a relatively short period, I have amassed a collection (though I cringe to refer to my wardrobe as collecting—more on that later). Five pairs of shoes. Two wallets. One piece of fashion jewelry (different than fine jewelry, which is in the four and five digits not three). And, two articles of clothing. What I find in all of these pieces is an attention to small details, but none considered with the intent to shine a spotlight on the brand. Instead, there are nods here and there to intrecciato, which is a characteristic symbol of the brand, but not one that distracts or detracts from the function or natural beauty of the item. And instead of a sense of rigidity in needing to reference it, there are endless variations and interpretations of it—like a cross-hatched print on a suede oxford or stamped into the sole of a sandal. I’m going to make a sweeping guess here and say that Bottega is one of the few if not the only brands in the fashion mainstream which does not make a single reference to its brand name on its accessories or ready to wear. Others in its immediate segment, known for similar levels of luxury and quality cannot claim the same: Brunello Cucinelli, Chanel, Hermès. Perhaps Loro Piana, at a similar price point if not same level of worldwide awareness, comes the closest to leaving its own name off everywhere but the inner label of its products. Some have said before that Bottega Veneta isn’t exciting—it isn’t a young person’s brand. I suppose this is true if you assume that all young consumers of fashion want flash. In comparison to something like Fendi or Givenchy of late, which are painfully trendy, and frankly I find even unflattering, I would bet with confidence on the longevity and quality of Bottega Veneta instead. For much of my life I have held a mid-30s mindset anyway, so this is no surprise. There are still elements that are diminish the brand’s integrity. Its fragrances are licensed to Coty. It makes trendy items aimed directly at the moneyed masses: rubber pool slides, a la Adidas and Puma and high-top sneakers with velcro closures. The brand is now making more bags with canvas instead of leather to bring the cost down. And, you’ll not only find Bottega Veneta stores in cool spots like Melrose Place in Los Angeles, it is also in many suburban malls (in Scottsdale outside Phoenix and Natick Collection outside Boston), as well as airports like in Milan and London. Though the same can be said for the Hermès and Chanel, so I suppose it is par for the course. In truth, being part of a public parent company (Kering Group) is a double-edged sword: great for access to growth capital, but with the requirement to produce consistent returns. Personally, the clothing doesn’t always fit my body. I am (and am working to maintain) a more athletic V-shaped upper body, with a slim midsection and a muscular lower body. I find that most items I tried recently during presale were better suited to slim, straight body types with less curve. And, Mr. Maier likes to toy with some strange silhouettes, like baggy, wide-legged pants or boxy tops. Nonetheless, what I like so much about the clothing and accessories I find at Bottega is their durability and lack of seasonality. And, some seasonal playfulness using different materials, colors, and shapes keep things interesting. Common themes are present of course: intrecciato and a meticulous quality, everything made in-house at the brand’s various facilities around the Veneto region of Italy. This lengthy ode is not to say that I don’t admire many things from other brand names and designers. Giorgio Armani (main line), Jil Sander, Prada, and Acne Studios come to mind. Dsquared2 for denim fit, even though the brand image is arrogant and awful. There are also a million smaller brands making beautiful things in niche environments with minimal image or brand history: Mp Massimo Piombo (men’s tailoring), Frederic Malle (fragrance), Buttero (shoes), Barena (casual menswear), Pantaloni Torino (trousers). Anne et Valentin (eyewear). But there is something special about Bottega Veneta, something unique that places it among the best in luxury (with prices to match), though it doesn’t blatantly pander to the widest possible swath of consumers, like some of its competitors do.